The Department of Energy has issued two awards on January 15 under their Funding Opportunity Announcement of July 31, 2015. In what took many of us by great surprise and delight, one of the announced winners was a molten-salt reactor concept. This marks the first time that the Department of Energy has committed any funding to an actual molten-salt reactor. Southern Company Services—partnering with TerraPower, Electric Power Research Institute, Vanderbilt University, and Oak Ridge National Laboratory to perform integrated effects tests and materials suitability studies to support development of the Molten Chloride Fast Reactor. The MCFR is also a next generation design with the most advanced safety features that enable its potential use across the country. But the particular type of molten-salt reactor selected for further research was an even bigger surprise. It is based on chlorides, rather than fluorides, and is intended to operate in a fast neutron spectrum. Molten-chloride fast-spectrum reactors are a lesser known variant of molten-salt reactors that have been of interest to many of us for some time. In October 2015 during a conference celebrating the 50th anniversary of the Molten-Salt Reactor Experiment at Oak Ridge National Laboratory, TerraPower announced that they were working on a chloride fast reactor design. During the presentation by Jeff Latkowski, the general advantages of molten salt reactors were mentioned, such as the chemical stability of the coolant, the strongly negative temperature and void coefficients, and the fact that the reactor can operate with essentially no excess reactivity. The salt-based fuel did not require conventional fuel fabrication and online refueling is simple and straightforward. High core power density is achievable as well as high thermal conversion efficiency to electricity. Actinides do not have to be removed from the core but can remain until they are fully consumed in the fission reaction. But these attributes are general to most molten salt reactors. Those of us looking for the particulars of a chloride reactor realized that very few technical details of the design were disclosed at that meeting. But the fact that TerraPower would be working on a molten-salt reactor of any sort was quite exciting considering that they had been focused on the “travelling-wave reactor” for many years. The travelling-wave reactor was a solid-fueled, fast-spectrum reactor that used liquid sodium coolant and a conventional steam turbine power conversion system. The chloride fast reactor was quite a departure from the travelling-wave design. The chloride fast reactor shares many of the same advantages of thermal-spectrum, fluoride salt reactors developed at Oak Ridge during the Molten Salt Reactor Program of the 1950s and 1960s. Both designs avoid the need for fuel fabrication and can feature simplified chemical processing techniques. Both designs have salt mixtures that have good thermal capacity and are chemically stable, although the exact relative properties between chloride and fluoride designs still waits on the disclosure of more technical details by TerraPower. But there are also important differences between fluoride and chloride designs. Fluoride reactors don’t necessarily have to be thermal-spectrum, but usually they are, using graphite as a moderator to slow down the high-energy neutrons of fission. In a similar vein, chloride reactors don’t have to be fast-spectrum, but they usually are intended to be, since chlorine is a less effective moderator of neutrons than fluorine. In fact, chlorine is such a poor neutron moderator that chloride reactors have the potential of having VERY fast neutron spectra, and that opens up new possibilities for missions that chloride reactors can fulfill. So considering that fluoride in general implies thermal-spectrum and that chloride in general implies fast-spectrum, the main differences in the missions for fluoride and chloride reactors are the differences in thermal and fast reactors. Fast-spectrum reactors have the advantage that the capture-to-fission ratio for actinides of all types improves considerably in the fast spectrum. They have the disadvantage that the overall cross sections go down by orders-of-magnitude. Thermal cross-sections for many actinides like plutonium are large, but the capture-to-fission ratio often isn’t very good. The beautiful advantage of the thorium fuel cycle is realized in the thermal-spectrum reactor, since uranium-233 has an excellent capture-to-fission ratio in the thermal spectrum. It improves slightly in the fast spectrum but it’s already excellent in the thermal spectrum. This is why thorium reactors can breed in the thermal spectrum, and as I have repeatedly emphasized, this is their central advantage. In the fast-spectrum, cross-sections are tiny. That means that it takes many more nuclei to achieve a given reaction rate than it does in the thermal spectrum. But for many fuels, namely plutonium, capture-to-fission ratios improve a great deal in the fast spectrum. If one wants to build a breeder reactor using uranium, or in other words, if one wants to build a nuclear reactor that efficiently consumes uranium, a fast-spectrum reactor is required, and a chloride reactor is probably the best kind of fast-spectrum reactor. Why is it the best? Because a chloride reactor doesn’t have to have any material in the core region other than fuel. Things in the core other than fuel, like coolant, cladding, and control materials, are the real problem in most fast reactor designs. 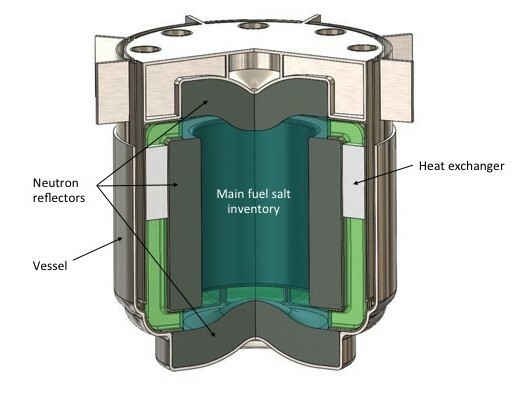 Solid-fueled reactors have to have a coolant and cladding in the core, and usually that coolant will have some degree of moderating capability associated with it. Sodium is the classic example. Its small amount of moderation can lead to what is called a “positive void coefficient”, which means that if the sodium isn’t there, the reaction rate increases. There are a variety of ways to address this, usually through changes to the geometry of the fuel of the core, but it would be easier if the problem didn’t exist in the first place. Having no “coolant” in the core is a beautiful solution, and the chloride reactor enables this, since it serves both as the fuel and “coolant”, carrying the thermal power out of the core to the primary heat exchanger. Liquid-fueled chloride reactors have been imagined ever since the molten-salt reactor concept was first proposed in the early 1950s. Alvin Weinberg mentioned the chloride reactor option in his 1957 paper. Other work took place in the 1960s. A Swiss-Polish scientist, Dr. Mieczyslaw Taube, wrote a series of papers in the 1960s and 70s about chloride reactors and their advantages, and was kind enough to have them sent to me when I made inquiries about the idea back in 2004. But no one has ever taken the chloride reactor concept to a demonstration stage, and this is unfortunate. Hopefully, with these new resources, this promising concept will advance in technological readiness and be able to fulfill certain missions that lay beyond the capabilities of fluoride reactors.